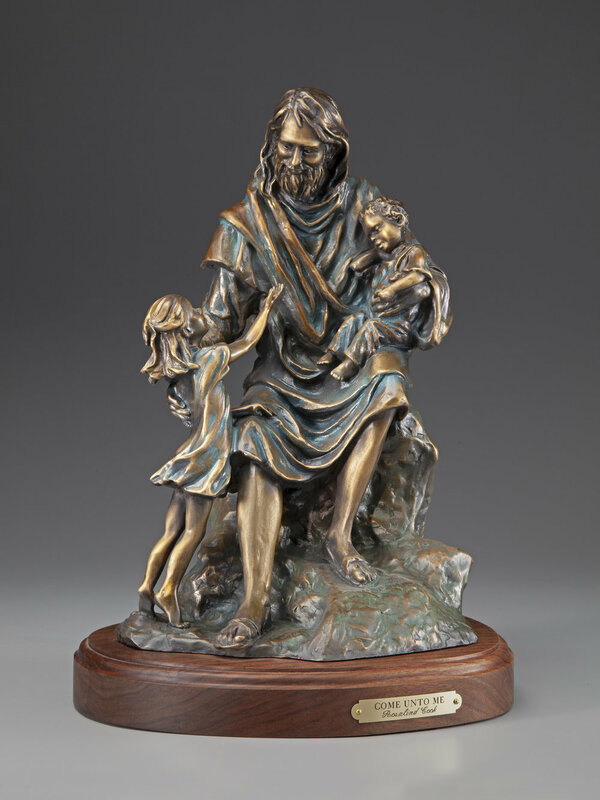 This sculpture shows a strong and loving Christ with the children. It is available in three sizes: 16" high; 28" high and monumental 7 feet tall. In designing this sculpture I chose a triangular composition which traditionally is a strong design for groupings. Every major line leads to the face of Christ who is the focal point and apex of the sculpture. The young girl is actively reaching up to Christ with gratitude or perhaps a request. The baby is completely relaxed and sleeping with complete trust and surrender. In our spiritual walk we find ourselves in both places. I have depicted Christ more to show His character qualities. He is a bit larger than scale to signify His deity. I have shown His compassion and His love. He is strong and well-built, wearing the typical attire of Biblical days and yet the children are contemporary children showing that He is the God of yesterday, today and tomorrow. His foot transcends the perimeter of the base indicating that He is accessible to all. This sculpture is appropriate for schools, churches, chapels, homes and Christian businesses. Put on a pedestal, a plaque can be attached for a memorial or honorarium. This sculpture is also available in a monumental size of 7 feet tall.